The Mare aux Hippopotames National Park was designated as a Biosphere Reserve by UNESCO in 1987 and a Ramsar site in 1990. It is a natural habitat that has remained fairly intact thanks to community protection efforts. This park is a crucial ecosystem for the preservation of regional biodiversity and for local people who rely on its resources. Yet the reserve faces increasing pressure due to a growing population and resulting agricultural expansion, whichtogether threaten its ecological integrity. Located in the Houet province about 60 km north of Bobo-Dioulasso, the Mare aux Hippopotames is in the Sudanian bioclimatic region, with annual rainfall approaching 1,000 mm. Overall, the reserve encompasses 192 sq km, of which 1.40 sq km is covered by a permanent water body that can reach 6.60 sq km during flooding periods. The reserve is well known for its freshwater lake (“mare” in French), linked to a network of swamps and floodplains and fed by the Volta Noire River. This complex of wetlands has high ecological value. In addition to its importance as a wintering ground for migrating birds, the Mare aux Hippopotames helps to recharge the water table, prevent or control floods, control erosion, and maintain a more moderate climate. The lake’s diverse habitats abound in wildlife unique to the region, including the famous hippopotamuses that inhabit the lake. Protection efforts have increased the number of hippopotamuses from about 30 animals in 2006 to about 100 in 2010 (SP/CONEDD, 2012). Other mammals also live in the reserve, especially elephant, bushbuck, and roan antelope. The reserve also contains 17 sq km of gallery forest and 110 sq km of tree and shrub savannas. For local people, the reserve serves as a fishery and provides critical resources, such as fruits, honey, wood fuel and ecotourism (about 1,000 visitors per year) (Pagen, 2006). 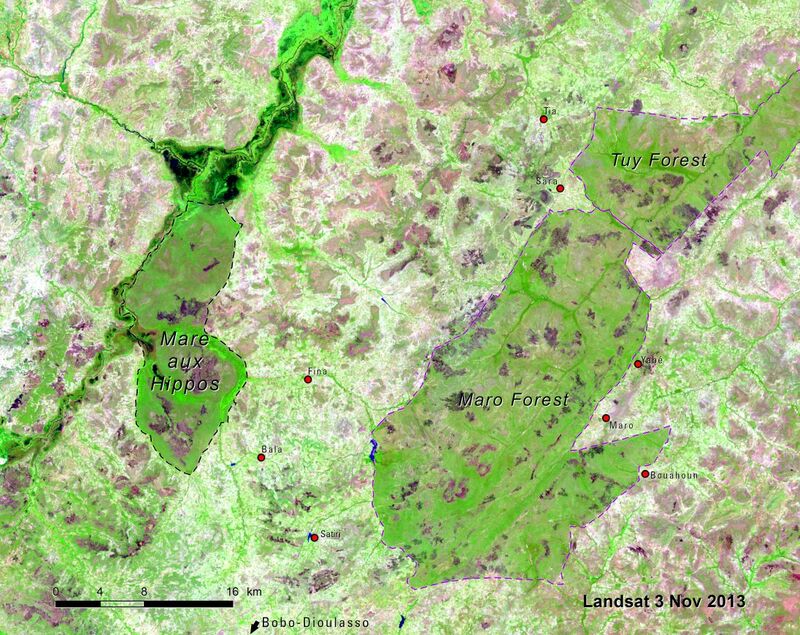 The satellite image from 1972 shows the beginning of agriculture encroachment into savannas. 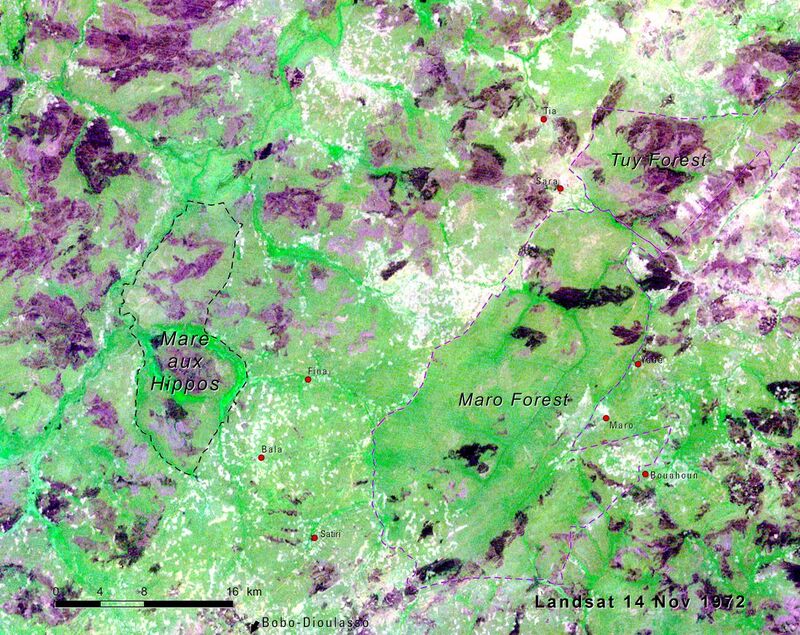 Croplands appear as light patches; the dark spots are burn scars from natural bush fires. In 1972, the reserve boundaries are hardly discernable within the surrounding savanna. By 2013, the Mare aux Hippopotames reserve’s natural savannas sharply contrast with the widespread transformation to agriculture. At least for now, the reserve boundaries are being respected by farmers. However, careful management and monitoring will be needed to preserve this ecosystem into the future.